In order to explore the centre part of the island, we start our tour in the bathing resort Costa Calma, drive up the west coast in order to drive back over the centre of the island. It is a long tour for which the whole day is needed, as we repeatedely have a stop in order to have some sightseeings or in order to enjoy the partly breathtaking views. The tour through the centre of the island is very diversified. We drive through a hilly landscape with a lot of valleys and canyons. We have a bath in the Beach of the Death, hike into a cave, visit a palm oasis, feed some chipmunks, visit a windmill museum and drive over a gravel road up to the base of a lava dome. We enjoy some fascinating views to different part of the islands from numerous view points that are partly on our way and/or we explicitly drive to. Moreover, we visit a cactus garden and maybe even a small zoo. It is hard to get more offered in one single day. Those who want to enjoy this tour with all its highlights should start early in the morning in order not to get under time pressure or maybe split the tour straight in two days for the case one does not get up early so easily. Our tour starts in the bathing resort Costa Calma. Those who start the tour from the southern bathing resort Jandía, will at some time drive through Costa Calma and will have probably a small break here. It is really beautiful to drive into this place; one drives through an avenue that is densely surrounded with palms and one hardly notices that one left this place again. What happened here? Did we take a detour, have we missed the place? 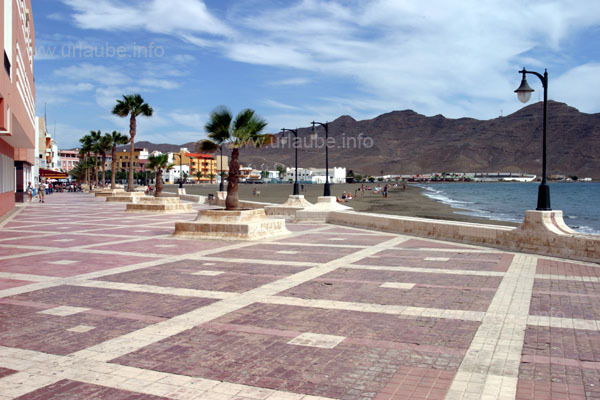 Costa Calma is a typical bathing resort that does not have any centre and a main road the way we know it. The main road is certainly gorgeously arranged with palms and at the sea side, one also discovers some accesses to hotels and some shopping centres, but that's it. Thus, there is no boardwalk where one can cozily have a coffee and there is no centre where one can have a walk. The best is just to drive through, looking a little to the right and the left and maybe guesses that there are thousands of tourists in the numerous hotel and appartment complexes who miss what is going on in the rest of the island. If we do not continue driving from Costa Calma the main road back in direction to the capital but turn to the left in direction to the mountains, after a short time, we get to a well arranged road in the small place La Pared. We are now in the most narrow part of the island. There are some rumors and/or historical theories giving a hint to some wall fragments that remained from the splitting of two island areas, Jandía in the south and Maxorata in the north.But these theories are not prooved. Why do we stop in La Pared? Maybe we do not stop but only drive into the place alongside the dapper main road and continue our way straight out of the place. What we see here is a small place that probably stands before the beginning of a big touristical development. With its palms and benchs, the main road gives the impression as if it was the pedestrian mile of a big city. But in fact it is only a nicely arranged gorgeous road at which there are no houses or shops; thus rather something to be amused of than to admire. But the reason for our side trip to La Pared is not the place itself but the beach to which one gets by driving throughout the place. Playa La Pared and/or Playa del Viejo Rey is a picturesque small beach of grinded volcanic rocks that is located in a picturesque rock bay. The long sand beaches of Fuerteventura are not everyopne's cup of tea; there are many bathing lovers who feel more comfortable in a beach area bordered by rocks than in an endlessly long appearing sand beach. One can park the car upside the bay, in order to get to the beach one needs to walk a few metres on foot. From La Pared we continue driving to the next place Pájara. The place Pájara barely interests us; maybe we shortly view the beautiful parish church Iglesia Nuestra Señora de Regla and admire the gorgeous city hall, from which the whole district is governed and administrated. But actually, it is not the place itself that interests us but the way to this place, as we are driving on a gorgeous high street that is, according to my opinion, the most beautiful panorama stretch of the whole island. The street is very well arranged and curves through the hilly landscape. Those who have been before in the south of the island will experience a completely different landscape in the centre of the island: while in the very south there are some steep and rough mountains and upside them a yellow desert area mark the landscape, the mountain hills in the centre of the island are smooth and eroded. There are one or two lava domes, but there is also clearly recognizable that over some million years, the erosion already did a good job. The landscape and the mountain formations are beautiful; one repeatedely stops in order to enjoy the fantastic views. On a small parking place there are two small view hills that can be comfortably accessed with sandals. Then one is rewarded with a panorama view far up to the north and the south of the island. After we enjoyed the high panorama road from La Pared up to Pájara in a very cozy drive, we felt like having a short stay on the beach and a small snack. From Pájara, we make a small side trip to the small harbour village Ajuy, also called Puerto de la Peña. Here, we find everything what we need for our day excursion: fist a parking place where we can let our car, there behind a supermarket where we can fill up our dispense of beverages, some restaurants to get recovered and a beautiful black lava beach inviting us to have a break. The beach has the frightening name Playa de los Muertos, the beach of the death. But don't worry, this name's origin is not due to the reason that many bathing tourists left their lives there; the name's origin goes far back to the old times, where the pirates land here and provided a devastating blood bath. Thus, one can confidently have a short break on this beautiful beach. Fine and dark lava sand that get so hot at noon time that one can hardly walk on it with bare feet, marks this beach section where there is always a good surge; thus, good fun for wave freaks! After we got a little recovered in the restaurant and rested a little from the drive, we started a small hiking tour that starts straight at the beach; At the northern end of the beach there is a small electric takle line that pulls the fishing boats out of the water. Right behind it, a rock path leads up the rock faces and from here, we start our 30-minutes hiking tour for which be better wear sneakers rather than flip flops.. The stony path is quite well secured so that one cannot fall down the steep coast. We march for approximately ten minutes up to a view point from which we have a gorgeous view into the bay Caleta Negra. What do we see here? An impressive steep coast bay with partly overhanging lava walls; We repeatedely discover some big caves and we also see some old ship landings. What was here before? In this area, lime was cultivated and loaded on ships; this is why today still some old loading points and lime furnaces are visible. From the Mirador, we march for approximately further ten minutes down the rock to two caves. Here, the way becomes more difficult, as the stairs that are hit into the rocks are partly very steep and narrow; but the whole of the way is well secured with some ropes. Thus, one descends to the sea and listens to the increasing sound of the surge beating against the steep coasts. One arrives at a big cave gate that invites to march into the interior of the cave. We walk a piece just like that, but then it gets dark. For the second cave, a torch is already needed. But who has one at one's grip during the holiday? After the visit of the view point and the Cuevas (caves in spanish) we walk back to the beach and rest for another short while, as the way was only short but the temperatures at the western rock faces were very hot and the air is stuffy so that there is nothing better than getting refreshed on the beach after the hiking tour before continuing the trip by car. After we got a little refreshed on the beach of Ajuy we drive back to Pajara in northern direction and from there we continue further to northern direction to Betancuria alongside the west coast of the island. The road curves up and down the beautiful mountainscape; there are numerous view points where one can park and enjoy the dream views either upwards to the mountain peaks as also downwards up to the sea. The eroded volcano peaks are fascinating; here, the erosion did a good job in the course of millions of years. The deep canyons between the mountain peaks, barrancos in spanish, are also witnesses of the years of erosion. Aproximately at 10 km from the north of Pájara we find amidst such a barranco a small village named Vega de Río Palmas. The inhabitants made a real fertile palm oasis of their village; Numerous palms and colourful fields on which potatoes, peas, salads and vegetables are cultivated invite to have a side trip to this place. What is fascinating is that from the view point, one first looks down to the village before one drives down the few kilometres up to the oasis. From the mountains, one also recognizes that at the lower end of the village, there is a small reservoir named Embalse de las Peñitas that once existed. Thus, this is the place where the the water of the canyon was accumulated. Today, the reservoir is filled with sand and boulder; once the reservoir project was started, the fail was already recognizable. Those who like to hike can do a small hiking tour starting from the reservoir up to the concrete dam and then down to the wild romantic canyon. The place Vega de Río Palmas can be beautifully enjoyed from the view point at the upside of it. By driving into the place, one indeed admires the abundant palms and fields, but the impression of a blooming oasis disappears a little; At the end of the place there is a small pligrimage church named Virgen de la Peña, that is a small side trip worthwhile. But we have still a long stretch to drive, as from the palm oasis the way continues up the hillsides to the next view point. The further driving in northern direction leads us to one of the most visited place of the island, that is the former capital of the island Betancuria. Here, in certain days, there are busses that transport legions of tourists for the city viewing. The whole place is under momument protection; there is the beautiful parish church Nuestra Señora de la Concepción and a small museum to see; the best is to loaf a little through the small town and enjoys the old houses and the fresh air. Small city is still exaggerated, as in this village, some few hundreds of people live. By continuing driving up the hill from Betancuria we finally arrive to the most beautiful point of this area, the Mirador Morro Velosa. From this view point we enjoy some views that require a long time to be assimilated and photographed. In the south, we look over the valley of Betancuria up to the highest mountain of the island, the Pico de Jandía. And in the north, a huge plain expands in front of one, Llanos de la Concepción and the valley Valle de Santa Inés. The best is simply to stay there for have an hour and to turn from one side to the other in order to get a view from the whole of the island. What happens if one loses some pieces of one's sandwich and leaves them there? A whole flock of Gophers is waiting to get a tasty meal. How affectionate these cute animals become by offering them a few crumbs of of cookies or bread. A real banquet is initiated and within only a few minutes, there are swarms with chipmunks! From the Mirador Morro Velosa, the most northern point of our day excursion, we continue down a well arranged road up to the valley, and therewith, our trip through the hilly landscape in the island centre of Fuerteventura ends. Once arrived down at the valley and/or an the plain, we continue driving quickly numerous kilometres; we drive with a speed of 100 on the wide roads and only brake at some curves and / or down to another place. The first place where we have a small stop is Antigua. A picturesque and nicely restored windmill at the city limit invites us to have a small side trip. We contemplate the windmill El Molino de Antigua and loaf a little in the small park behind the mill or have a small snack at the restaurant in front of us. In the old historical centre of Antigua, we find the beautiful church Nuestra Señora de la Antigua, that we shortly view. Moreover, we also go behind the church where we can view the exterior of a pastel-coloured art nouveau villa. Only a few minutes after Antigua we arrive to the small place Tiscamanita, a village that still had a highlight to offer us. In Tiscamanita, there is a mill museum (Centro de los Molinos), that we like to experience. We do not need much to view the restored windmill and to get a little introduced in how such as mill really works. Neither we have much time, as a highlight is waiting for us that will take one hour of time. At the bus station of Tiscamanita, a seemingly insignificant path leads into the village. After a few hundred metres, we see the aloe-vera plantage at the left and then there is already the end of the tarred road. Now we have to continue on the unpaved road that is rough and hilly! At a crutch, we stay at the left side and after approximately 4 km we are straight underneath a lava dome, the Caldera de la Laguna. Here, still today, volcanic ash is mined; we are practically amidst a mine, with a normal small car! The lava dove looks menacing, as it would collapse in any minute. But we did not take the unpleasant drive on the unpaved road in order to have a close look to the lava dome; we are more interested on what the volcano had disgorged more than 10.000 years ago. So we look over a wide field of old volcanic rocks that is called Malpaís Grande in english "Big Bad Country". Here, one gets reminded on the destroying power such a tiny volcano can have: the land has been covered for kilometres with lava of metres height. Returning from the unpaved road, we are happy to drive again on a normal road. We continue driving to and then down the coast in directio to Gran Tarajal. But before we have a small stay in Gran Tarajal we do a side trip to Las Playitas. The name (in english: small beaches) already gives a hint that here, everyrthing is smaller. We drive down to a long extended bay named Cala de las Playas, where we find a wind-protected dark sandbeach. We do not stay for long in the old fishing village; out attention is probably attracted by some villas with gourgeously arranged blooming gardens, but the reason why we went to Las Playitas is not the place itself but a light house that is standing on a high rock. Shortly before the place Las Playitas, we find a road curving to the left that leads us straight to the Faro Punta de la Entallada. The tarred road get increasingly narrow after some kilometres and the ascend to the rock is only a tiny road. One has to highly concentrate during the driving, as at the left of the road, there are partly unsecured precipices. We finally arrive at the 185 m heighted light house and admire the beautiful construction. But much more than the light house itself, the view down to the sea, alongside the coast up to the land fascinates us. We do not need much time for the side trip to the light house, but the drive up to this place is worthwhile without doubt due to the impressive panorama view. From Las Playitas, it is only a stone's throw to the neighboured place Gran Tarajal. By driving into the place, for the first time since we are on the island we get into a small traffic jam. We now notice that we drive on the second biggest city of the island; in Germany, a place of a few thousand inhabitants would not be called a city. But Gran Tarajal has a big meaning for the island: it is an important shopping and service centre for the southern area of the island. What the capital Puerto del Rosario is for the north of the island, Gran Tarajal is this for the south of the island. But Gran Tarajal is not an ugly city but a nice place with a wonderfully arranged boardwalk. We are happy that we can park for free at only 100 m distance from the boardwalk. Then we find what a vacationer uses to dream of: Gran Tarajal haeautiful and big lava beach (Playa de Gran Tarajal) with lots of space for ball games between the sea and the boardwalk; Right behind the beach there is the beautiful boardwalk with numerous restaurants and bars. It is good fun to walk the boardwalk up to the harbour and back again. In one of the restaurants where we have a small lunch, we immediately notice that there are mainly local people and only few tourists. During our city walk we also notice that Gran Tarajal is the most important shopping centre in the south of the island. There are no shops where one can buy some towels and postcards; here are shoe shops, shops for kids, department stores and other specialised shops selling what the island inhabitants need for living. Gran Tarajal was good fun; it is a nice place where one can easily relax from driving, either on the beach or at the boardwalk. We drive back from Gran Tarajal to Costa Calma. The well arranged road goes up and down, passing some unspectacular places. From a distance, we then see some big and dense palm groves; There must be something! Finally, we arrive at the small place La Lajita, where the are colourful flowers blooming at the right and the left side as if we arrived at the island's paradise. What is offered here? There are some big signpostings rapidly appearing and leading us to the zoo and the cactus garden of the island. This is a thing we would like to experience, as we also only have a few kilometres to drive up to the starting point of our tour. In the zoo, we find countless different kinds of birds. We also admire some crocodiles, monkeys and camels. Here, a few hundred dromedars are kept, not only for exhibiting purposes: it is a highlight for the children to have a half an hour tour on a camel from here. The adults, to the contrary, look forward to get recovered in the coffee bar and admire the big cactus garden afterwards. What impressed me was the whole complex rather than the animals or the plants. From La Lajita, there are only a few minutes back to our starting point Costa Palma and/or half an hour drive for those coming from the southern holiday resort Jandía. It was a big, long tour in which we made many kilometres. but as we started in time and had two pleasant stays on the beach, it was a pleasant tour and very diversified.